A station was moved from Lincoln and Eastwood to Leavitt and Lawrence, as part of the new streetscape and road diet on Lawrence. Divvy bike-share stations were designed to be easy to move around, with their modular construction and off-grid solar power. Sure enough, plenty of Divvy members have had their routines disrupted by station moves lately: 8,000 Divvy members received word this year that stations they’d recently used were on the move. One Divvy member forwarded two such emails to Streetsblog and asked why the stations had to be moved, since the new locations didn’t seem any more convenient than the prior locations. Over in the heart of Lincoln Square, Divvy moved a station from Lincoln and Eastwood avenues, in the midst of a thriving retail district of small shops clustered around the Old Town School of Folk Music and the Davis cinema, one-third of a mile away to Leavitt Avenue and Lawrence Avenue. Even though the move will make Divvy trips to Lincoln Square businesses a bit less convenient, there’s another dock one block up Lincoln at the Western Brown Line ‘L.’ Plus, the move expanded Divvy’s reach into the neighborhood north of Lawrence, and gives a boost to a revitalizing shopping area on Lawrence Avenue. Sean Wiedel, who manages Divvy for the Chicago Department of Transportation, said “we worked with the 47th ward office to better serve the new Lawrence Avenue streetscape and businesses that are opening in the corridor.” Winnemac Park residents were brought into the Divvy service area, he said, whereas before they would have to cross Lawrence – a mean feat before the diet – to access existing locations in Lincoln Square or at the Ravenswood Metra station to the east. Additional Divvy docks were added at the ‘L’ stop to accommodate potential new demand within the Square. The second relocation moved a Divvy station from Milwaukee Avenue and Green Street in River West two blocks away, to Union Street and Grand Avenue. The previous location wasn’t perfect, since it was hidden behind a block of dilapidated buildings and all but invisible from the Blue Line station entrances half a block away – but the new location is even further from the Blue Line, and also across a busy six-way intersection. Divvy and CDOT moved a station from this location, at Green and Milwaukee, two blocks away. Wiedel said the move was necessary because of impending construction at the old site, where the “battleship gray” buildings have been adorned in a succession of street art. The buildings will be demolished and replaced with over 200 new transit-adjacent apartments. “The Union/Grand location was the best available spot in the area,” he said, “where we could safely locate the station on a wide sidewalk.” Wiedel added that the site’s developer, Fifield Realty Corporation, paid for the move even though construction isn’t quite imminent. It’s been nearly a year since the development was approved, and so far no building permits have been issued. The new location could prove more convenient for one group of Divvy users, though. The new Divvy docks are located east of Halsted Street, where most of the businesses around this intersection are clustered. Customers headed to Emmit’s Pub, Funky Buddha Lounge, or Iguana Cafe can now ride over without having to walk across the entire Milwaukee/Grand/Halsted intersection. I can’t wait for that blighted pox on River West to be gone. Good riddance! The Grand/Milwaukee Divvy station move is a huge inconvenience. I used to use it regularly when it was right around the corner from the Blue Line. Now it is two and a half blocks away and I never use it anymore. I bet they’d be adding new ones instead of (or in addition to a little bit of) moving them if they didn’t have supplier problems. The new location is inconvenient for me too, but I used to use it when dock surfing between Logan and the loop. It was an easy-off, easy-on for southbound Milwaukee Ave. now? Haven’t used the location since it moved. 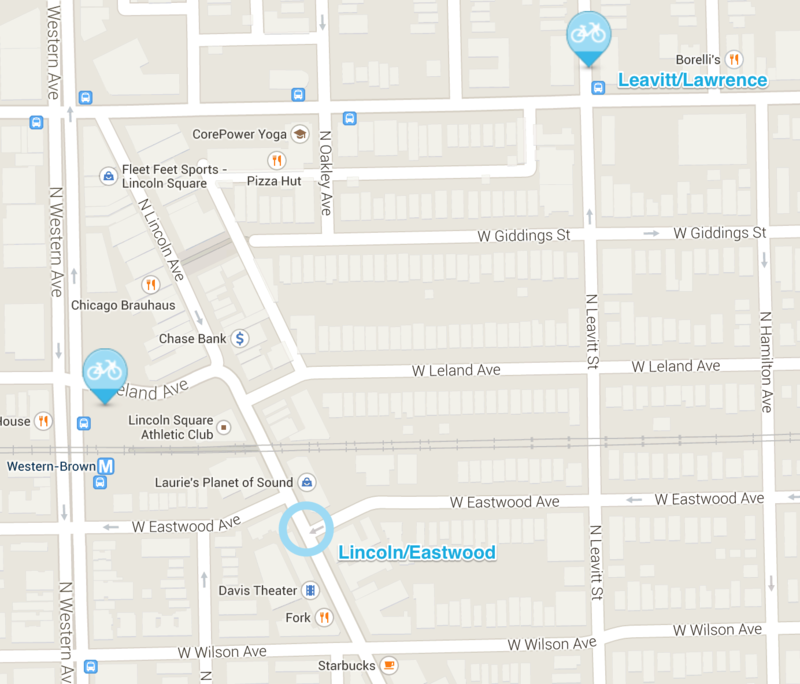 Another station was recently moved in Lincoln Square/Ravenswood area, from Wolcott @ Lawrence to Ravenswood @ Lawrence. It is now right at the Metra stop. While I like it, I don’t understand the timing. Both locations are not immediately impacted by the Lawrence streetscape work. I’m under the impression that the Wolcott/Lawrence location was a temporary relocation from somewhere else adjacent to the Metra stop, either related to the construction at the stop or the Mariano’s complex, and now the station is back adjacent to the stop where it was intended to be. I’m an occasional user of that station, as it’s sometimes convenient for me to grab the Metra from the loop to get to Lincoln Square/North Center. I actually preferred the old location because I didn’t have to deal with Lawrence at all. I could cross as a ped at the light at Wolcott or Ravenswood, grab a bike and head south on Wolcott, but it definitely makes more sense being next to the station. Maybe it’ll eventually get relocated to the west side of the tracks when the new Metra station opens? It has always been a weird site since I moved here 8 years ago. I’m glad it wasn’t demolished because, even though it’s super ugly, it “holds” the intersection together visually and is superior to an empty, fenced-in grassy area. And it also provided a really cool canvas for street art. Possibly. Only 20% of the 175 new stations will be installed in the existing service area. Was the Ravenswood space unavailable during Metra station construction? Is there any update on the aftermath of the Bixi bankruptcy? I thought its assets were sold to a businessman who made his fortune selling furniture.